I managed to find a Dance Studio Jacket in my size yesterday, size 10, and I decided to bring it home and think about it as a birthday present option. My husband never usually gets me lululemon for my birthday but he agreed to this year probably because I wasn’t giving him any other good ideas. Anyways, I’ve been eying the Dance Studio Jacket in all the pictures I’ve seen so far and really loving it on others (particularly in this color) but I just couldn’t decide if it was a style of jacket that would fit into my daily wardrobe. I tend to wear either knit wraps and cardigans for a bit of a more stylish look or my Sing Floss Travel Jacket or Gratitude Wrap for more casual days. 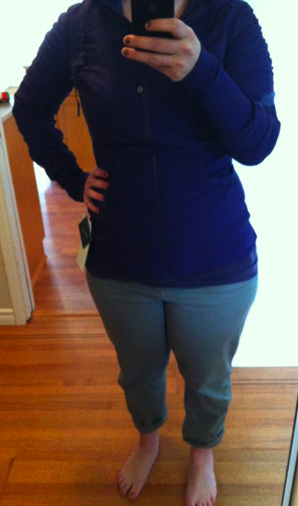 My Stride jackets have always gone unworn since they don’t fit the cozy factor that I need when I dress casually. I decided that I could take more of a risk with a birthday present than something I’d get myself. This jacket is surprisingly cozy thanks to the sheer luon jersey on the inside but it’s more structured and sliming than a hoodie. My husband really liked it on me when I tried it on so I definitely think it’s a keeper. He’s a hard critic of lululemon clothes afterall. The sizing is comfortable in TTS and the arms and chest are roomy enough. 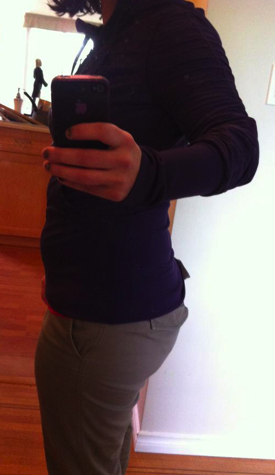 The bottom portion is fitted and can show muffin top but not enough to make me not want to wear it. 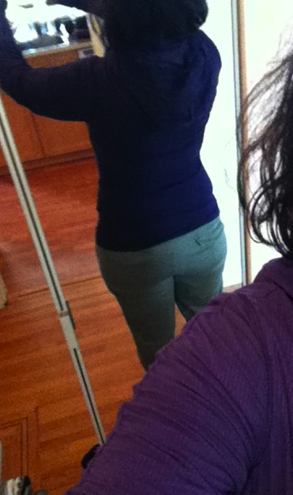 I think since it’s so fitted it’ll look fine if I lost weight where as a 12 would look perfect now and then be too big. I can wear this over top of a cabin ls comfortably but the arms lose it’s looseness. Most people are sizing up in this jacket one or two sizes and I can definitely see that if you have a large bust, muscular arms or broader shoulders but I don’t tend to feel restricted in the arms with lulu clothes generally so I’m fine sticking with this size I think. I maybe wish there was a touch more length to this though and maybe slightly more a-line at the hem. "Meditate Pullover, City Practice Pant and Real Houswives of Vancouver"
"Special Edition Swiftly Tech SS"